Ministers and campaigners alike took to the airwaves this morning as the new Personal Independence Payment (PIP) - replacing Disability Living Allowance (DLA) - began to be rolled out across the country. Back in April new claims for PIP began to be taken for the first time in parts of Northern England. Existing claimants of DLA have to wait until October this year or later, depending on their circumstances, before they are reassessed. Today is significant because new claims can now be taken across Great Britain, and new DLA claims are no longer accepted. Naturally, the Government has published projections for how many people it thinks will end up claiming each component of PIP, drawing comparisons with the current DLA caseloads. These projections, published in December last year, are the basis for most of the numbers of 'winners' and 'losers' we're seeing across the media. By the end of the period (October 2018 as currently planned), the Government estimates that 1.75 million DLA reassessments will have been processsed. 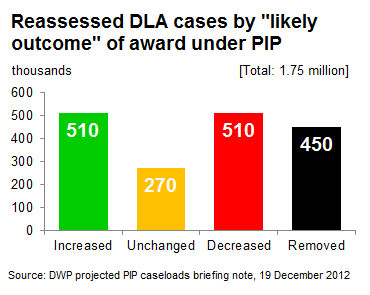 510,000 recipients are expected to get a higher award under PIP compared to their DLA claim. 270,000 will see no monetary difference. 510,000 will have a reduced payment and 450,000 will have their payments removed altogether. However all these numbers could well turn out to be wrong as for now they're just forecasts based on the Government's 'reassessment criteria', and once the tests start to be carried out we'll get a better idea of what existing claimants are set to get under the new payments. Disability Charity Scope: "600,000 disabled people set to lose Disability Living Allowance"
If 450,000 are currently forecast to lose their payments under reassessment, where have some campaigners got their figure of 600,000 losing out from? By including new DLA claimants who would have applied for the benefit by 2018 if PIP weren't being introduced. "By May 2018 the whole DLA caseload, including children, 16-64 and the over 65s, would be around 3.6 million without reform and 3 million with the introduction of PIP." This makes some sense at least as a caseload projection - there are currently 3.3 million claimants of DLA (November 2012) - almost a million more than ten years ago. Daily Mail: "140,000 claim disability cash for a bad back: Benefit handed out to thousands for conditions including asthma and drug abuse"
The Mail claim to have got these numbers from a Freedom of Information response, but the figures themselves are freely available from the DWP's tabulation tool. 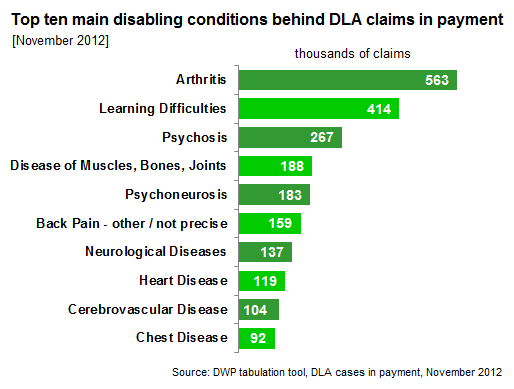 Figures for November 2012 break down the current 3.3 million claimants by their 'main disabling condition'. Currently DLA claimants can receive either or both of a 'mobility' and 'care' component. The care component is intended to support those needing help with personal care while the mobility component helps people who have problems walking or getting around. Either can be claimed by someone with back pain as their main (but not necessarily only) condition. 160,000 people in total claim mainly based on back pain: 140,000 people claiming the mobility component do so and 135,000 claiming the care component (there is overlap between the two). So the Mail's figure here is correct, although back pain itself can take a variety of forms - some more serious than others. However, the Mail erroneously states in its subheading: "135,000 people who suffer from back pain are given £80 a week to pay for personal care". The £80 actually represents only the higher rate of the DLA care component (£79 per week), which is only claimed by 26,200 people. For all back pain claimants of the care component, the average rate paid is closer to £40. We've asked the Mail to correct their figures. Minister for Disabled People Esther McVey: "71% would have indefinite awards, without regular checks"
'Indefinite awards' for DLA is a topic Full Fact has visited before after the Work and Pensions Secretary, Iain Duncan Smith, made a similar claim a year ago. It's based on a DWP analysis from a few years ago which shows that 71% of claimants of DLA have an indefinite award. "If your benefit award is for an indefinite period, you will not usually have to make a renewal claim. Indefinite awards can sometimes be reviewed and you may need to have another medical examination as part of the review." However, this figure doesn't apply to new DLA awards. The same DWP analysis showed that only about a quarter of new DLA claims were for an indefinite award, with the rest for fixed terms. In spite of PIP's rollout beginning in earnest today, DLA will still be around for several years at least. All the figures for new 'awards' following DLA reassessments are projections at this stage and, as with Incapacity Benefits reassessments, we'll have to wait until published figures on assessment outcomes - and crucially appeals - become available in the next few years before we can judge how accurate these forecasts really are. Are people with mental health conditions now receiving higher disability benefit payments?